The expedition to the Atacama Trench was funded by BMBF (for ship time) and the ERC project HADES (European Research Council Advanced Investigator Grant-Nr. 669947; Benthic diagenesis and microbiology of hadal trenches”), the University of Southern Denmark and Max Planck Society and will be featured as part of the 2018 Challenger Conference being held at Newcastle University September 10-14. From an unmanned submersible, protected by a casing of stainless steel almost an inch thick and a window made from super strong sapphire crystal, we can observe the life that thrives at our planet’s most extreme and darkest depths. Thanks to technology and sheer material strength, we can temporarily trespass into this high pressure environment. But in stark contrast to the robust deep sea imaging equipment we rely on, the creatures our camera records look extremely fragile. Four-and-a-half miles beneath our research vessel, which was floating on the surface of the Pacific Ocean, we captured footage of several previously undiscovered species of hadal snailfish. With delicate fins and transparent, gelatinous bodies, they are some of this environment’s most enigmatic inhabitants, fish that – at first glance – look like they should be incapable of surviving under such enormous pressures. And yet, it appears they are thriving in this strange world. In spring, a team of 40 scientists from 17 different nations conducted an expedition to the Atacama Trench, which runs along the west coast of South America. We were there to find a particular snailfish. On a previous expedition, our principal investigator (Alan Jamieson) had photographed a snailfish with long, wing-like fins at a depth of 7,000 metres. Only one species, Notoliparis antonbruuni was known to inhabit this area at such a depth. It had been described from a single specimen, so badly damaged that we are not able to use it to identify our images of living animals. We wanted to find this elusive winged snailfish again to learn more about it and observe it in its natural habitat. These hadal snailfish tend to live at depths between 7,000 and 8,200 metres (“hadal” simply means anywhere below 6,000 metres), but their apparent rarity is perhaps misunderstood. Because of their extreme habitat (at least for humans), they are difficult to observe rather than actually “rare” as we know it. And with the right equipment and opportunity, we were confident, after ten years of study, that we knew where and how to find them. The Atacama Trench is part of the Peru-Chile subduction zone, a large 590,000 square kilometre area where one tectonic plate is being forced under another and the ocean floor quickly plunges to more than 8,000 metres. 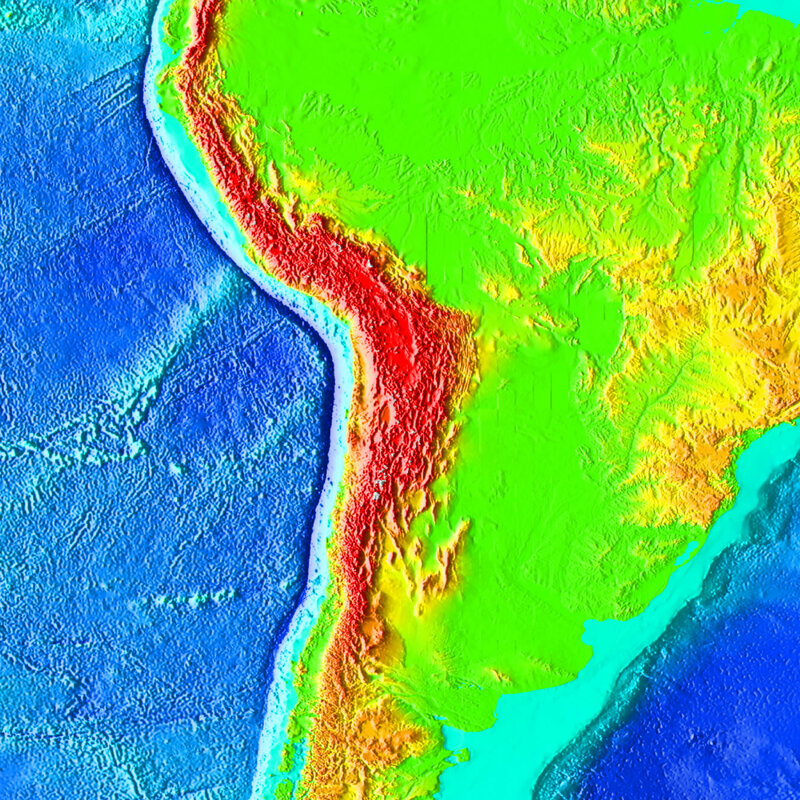 Its volume is almost the same as the neighbouring Andes mountain range, which the tectonic subduction zone also creates, and exploring it is no easy feat. We deployed our freefalling cameras 27 times – from the relative shallows at 2,500 metres to the trench’s deepest point, Richard’s Deep, at just over 8,000 metres. This enabled us to take more than 100 hours of video and 11,000 photographs at the seabed – and the results did not disappoint. The snailfish we were looking for made an appearance – and it wasn’t alone. Two other previously unknown hadal snailfish species were present in the footage. In fact, all three species appeared in the same shot on one occasion. Out of necessity, they were given quick, stand-in names: we called them the “purple”, the “pink” and the “blue” Atacama snailfishes. The “blue” appeared to be the “winged” species Jamieson had recorded previously. Its long trailing fins and prominent snout resembled the Ethereal snailfish we had recorded on another expedition to the Mariana Trench, far away on the other side of the Pacific. The “pink” species, meanwhile, was more robust and was closer in appearance to the Mariana snailfish (Pseudoliparis swirei) that we described in 2017 and which also inhabits the Mariana Trench. To see these two species – with such different body plans – sharing a trench again got us thinking: they must be doing something different to one another down there to both carve themselves a niche. The third species, a small purple fish, looked more like the snailfish we would expect to see on the shallower abyssal plains – at a depth of around 3,500 metres. But one of these purple snailfish, just 9cm long, followed its invertebrate prey into one of our traps. This small fragile fish is currently the only physical specimen of the new species and should eventually allow us to give it a formal scientific name. And while we much prefer our video of the living animal, only a physical specimen can be deposited in a museum and used to formally describe a new species. Once on the surface, we photographed this specimen while it was suspended in chilled seawater – its body is simply too fragile to support itself in air and we didn’t want it to suffer the same fate as the poor blobfish, which, for the record, really aren’t that sad-looking (their jelly-like bodies just collapse when exposed at the surface). Over the following months, we then put the specimen through several stages of preservation to avoid shrinking its largely gelatinous body. So that scientists (and the interested public) don’t have to fight over access to a single, fragile specimen, it was also CT scanned at the Natural History Museum, London, creating a detailed 3D digital model of it, inside and out. Such digital back ups are gaining traction in science – take the Scan All Fishes project, for example. And disasters like the recent fire at Brazil’s National Museum, which will have wiped out many unique specimens, also show why they are so important. But what have we discovered about these mysterious creatures? First, as fish approach the absolute extremes of the environmental conditions that they can cope with, they do not simply eke out an existence but thrive. It is also emerging that some trenches support not only a single specialist species but multiple species with body plans that hint at different lifestyles within the trench. Second, the snailfish family (Liparidae) is not only the absolute winner of the deepest fish award (having been found in multiple other trenches), but species are living in trenches that at times are over 10,000km apart and entirely isolated from one another. Incredibly, snailfish exist at these extreme depths, wherever these extreme depths are, and in numbers never thought possible. And the snailfish is just one story that emerged from our expedition. Over the coming months, we will continue to process the huge amount of data we collected, the most we have ever gathered on a single voyage. Our assessment of the large mobile animals we filmed will feed into the project’s larger goal to understand the biological and chemical processes within the trench as a whole.